Boots is a very durable and comfortable shoes that are military, but in civilian life it can be found very often. This perfect footwear have a drawback – its hard and long lacing. So pinching wasn't torture for you, you need to have at least a little skill. Zachorowania ankle boots anew each time they are men. Do not allow even a slight weakening of ties, just the right lacing able to perform the basic function of the upper part of the Shoe to protect the ankle from sprains and injuries. Careless execution of the lacing can drag-and-dropped foot, leading to circulatory disorders. When choosing shoes, keep in mind that, as will be lacing. 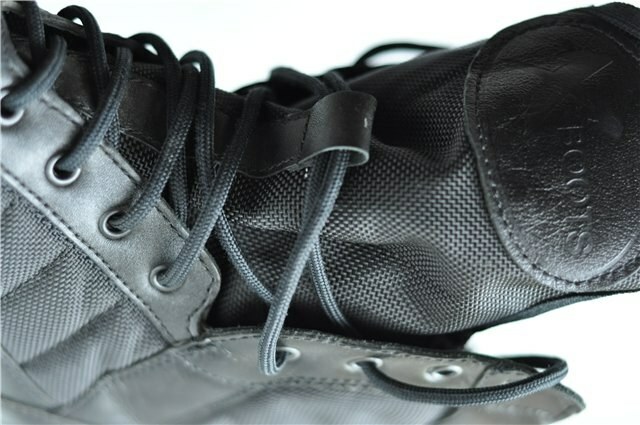 By far the most reliable is lacing through rings and loops, but the lacing through the hooks will cling not only laces but also foreign objects and clothing. Known to all of us lacing through the holes often unevenly compresses the foot, which leads to discomfort while wearing. In addition, in bad weather through hole can get moisture. "Army lacing" is the fastest and most commonly used method to lace up the boots. Start this lace-up with horizontal threading the lace through the bottom holes. Then lift the lace straight up and thread through the next loop, repeat with the other end. Then cross the laces and pull from the bottom up through the next row of holes, and then again raise them right, etc. Method of lacing ankle boots "criss-cross" very simple. First, take a string and route it horizontally through the bottom of the hole. Then cross over the ends of the lace between itself and pass them to the next hole, moving from the bottom up. In the process of pinching attract good boots to the feet. To twisting of ankle boots, you can use the method of "ladder". Take a string and stretch it horizontally across the two bottom holes. Not crossing over the ends of the lace raise them right and pull through the next two holes from the bottom up. Then cross over the ends of the laces, thread them into the loop, which was formed in the opposite end of the strap. Again thread the ends of the laces right at the top of the hole and continue stringing this way to the top of the Shoe. Tie the laces knot and make a bow.